What is wrong with (real) Christians? It would be better - indeed it is ultimately necessary - that people become real Christians; but in the modern world, nearly real Christians are fundamentally (i.e. deeply) terribly deficient and defective. And I am not talking about failing to live-up to ideals of Christian morality - I mean that their whole way of thinking and being is anti-Christian, contradicts Christianity. In sum, modern Christians believe as Christians, but think as materialist atheists. Indeed, much of the problem is exactly this disconnection between believing and thinking - Christians 'believe' all sorts of things - but their actual living at the level of thinking is all-but unaffected by those beliefs. I don't just mean that Christian thinking fails to match up to Christian beliefs, but that their beliefs don't affect their thinking At All. Why are so many modern Christians Leftists? Many are quite extreme Leftists; but nearly all are adherents and supporters of mainstream politics of one sort or another, accepting the secualr ideas of what is significant and important (e.g. The News). And all mainstream politics is Leftist (everything in public discourse, in official communications and the the mass media - including all the supposedly 'Right' wing groups and parties - all are fundamentally secular-materialist in ideology and thought-structures). Yet Leftism is literally demonic; a systematically and strategically anti-Christian ideology - purposively destructive of The Good. Why are so many Christians so deeply dishonest in their work? And why can't they perceive this? Modern work demands systematic dishonesty - especially at the managerial level. Surely this is obvious? - yet many Christians occupy leadership and managerial roles which they occupy because they are good-at dishonesty, and where they are dishonest for a living; and there is no sign they feel they have anything to repent. Christians are too ready to excuse-themselves on grounds of pragmatism, and to try and distinguish in their actions between a stark made-up lie (regarded as bad) and the deniable deliberate misleading of others (regarded as part of life...) - when in fact the deniable misleading of others, often pursued through many stages and levels of organisation, is a far worse (because more calculated) sin than is making-stuff-up on the spur of the moment. The modern world is bureaucratic, and bureaucracy is death. Yet modern Christians are bureaucratic - they believe-in bureaucracy as the best and proper way to do things - from government down to the local jumble sale. Their churches are bureaucratic - everywhere and in all things is the implicit assumption is that the organisation is right, the group is right, committees are right, the vote is right... All this is obviously and profoundly anti-Christian (because Christianity is rooted in individual agency, and only individuals can be moral or know The Good) - and yet Christians cannot see it! Modern Christians - even the real Christians - regard the world reductionistically, materialistically, as positivists. Events are seen as either mechanically caused or else random - even one's own thoughts are thus seen; the world of the modern Christian is drained of meaning at the finest and most exact level of analysis. They theoretically-believe that the world is God's creation, but in their moment-by moment thoughts they regard the world just as described by 'science' (maybe sometimes externally-shaped by God). In sum, modern Christians think as nihilists - actual-believers in nothing, deniers of the reality of the real. They do not see the world as alive and full of purpose, and they do not even want-to - they don't think this is important. They think the only thing important is what they believe, what they profess, how they live by the rules. And the fact that everything around them and within-them is - in practice - regarded as unconscious, dead and pointless is (if thought-about at all) regarded as a sign of progress in Christianity, an escape from superstition; and indeed a positive good since it avoids the deceptive and demonic hazards of 'spirituality'. In sum, modern real Christians are deadly-literal, superficial, fearful - and wrong. Their literalism shows in how they regard themselves as mechanical effect; agency merely as a craving to be externally-controlled and compelled by rules, bureaucracies, drilled-in habits of behaviour. They are superficial, lack spontaneity, are phony and manipulative in their interactions - and this is because they are thinking like modern materialists while trying to live by a set of beliefs and practices that are merely stuck onto the surface of this purpose-denying, meaning-denying, life-denying set of fundamental assumptions. Modern Christians are like crude Robots who say and do the right things - but inside are merely whirring circuits following rigid programmes. And they like that way. Because, technically, modern real Christians are, at the deepest level, metaphysically atheist materialists; and their Christianity is a stuck-on lifestyle choice at the level of professed beliefs and sticking to the rules. But nobody is perfect! It is, indeed, very difficult indeed Not to be a materialist atheist at the metaphysical level, in the modern world - our upbringing, our history, and present society all inculcate and enforce it. However, it is essential that modern Christians become aware of this very serious, very important, and indeed lethal defect of their faith. Only if these facts are known can they be repented; and only if they are repented can they (even potentially) be overcome. The paradox of modern Western life is usually missed. Officially we live in a materialist and secular world, in which the religious and spiritual is excluded from all serious and official public discourse; and where public priorities are selfish personal values such as prosperity, comfort, convenience, thrills and entertainment. Yet if this was the whole story then public discourse would be much more Right Wing than it actually is - because materialism implies some form of selfishness - probably enlightened self-interest. What this tells us is that the secular-materialist perspective is not the ultimate one in the Modern West - because it is only allowed to operate within a 'higher', much more powerfully-enforced ideological-ethical framework. Since this overall framework is not materialist - it is in fact necessarily immaterial, indeed the framework is spiritual. However, this ruling spiritual framework which constrains materialism denies its own existence. It is there, it is pervasive, it is compulsory, it is enforced by rewards and sanctions... and yet it denies its own existence! To me this seems obviously the work of immortal demons who seek the self-chosen damnation of Men; and that therefore I infer that demons rule this world: at the highest level, they are in control. On that basis, there isn't any purpose or meaning to life; and our strivings and relationships are consequences of undirected chance plus past evolutionary pressures. There isn't anything to be said about why we are here, or what we 'ought' to do. Things just are as they are; and n conclusions can be drawn about anything. Hence the pervasive nihilism of modernity, and the consequent undercurrent of despair. Our dissatisfaction with the pointless futility of everything can be explained, but never gratified. But, we need to be clear that the above scenario is not a discovery but an assumption. The physics, chemistry, biology explanation did not come from science; instead modern science came from that explanation. Modern science operates within the metaphysical assumption that only modern science is real - nothing else exists. Science cannot discover any meaning or purpose - neither can science disprove the reality of meaning and purpose; because meaning and purpose are excluded from science by its founding assumptions. For example, there is no point in trying to claim that random chance plus Natural Selection is insufficient to explain the full range of observed phenomena; because these are the only permissible explanations within modern biology. Anything not currently understood on the basis of randomness and selection is merely something for which the evidence is not yet available. Upon such foundations are constructed the entire structure of the modern world - in other words, the modern world in all its vast complexity has no foundations. None At All. But why then is the secret kept secret - why not just be explicit about it; why not let people know the meaning of their metaphysics? Why not just let them utterly and upfront despair, and give-up, and die? Because the beings who ultimately control the modern world know for sure that the reality is utterly different from the assumptions of 'science'. They know this because these ruling beings are demons who have lived in Heaven and who have rejected God and Creation and are engaged in engineering the destruction of creation and self-damnation of Men. And for this purpose, the creed of denied-nihilism has proved itself to be very valuable. The most important first step in the modern world is to reveal modern metaphysical assumptions as being assumptions. That might be easy, if it was acknowledged that there are metaphysical assumptions, but 150 years of philosophical discussion has concluded that the distinguishing feature of modern'scientific' thought is that it has no metaphysical assumptions - but that it is empirical and purely evidence-based. Having metaphysics is regarded as obsolete religious obfuscation - modern Man is too hard-nosed to be 'fooled' by metaphysical mumbo-jumbo. So modern opinion denies the validity of metaphysical discussion: modern opinion denies that it has any fundamental assumptions at all - it is merely practical, merely trying to 'make life better', just 'getting on with the job' instead of wasting time and confusing or manipulating people with airy-fairy nonsense about 'metaphysics'. This is why the modern predicament has proved so difficult to solve. The problem is buried at the foundation, but the conventional wisdom is that there are no foundations. If metaphysical assumptions were acknowledged as real and inevitable, then we would have a good chance of changing them. But since they are regarded as imaginary - then we seem to be stuck with modern metaphysics. And modern metaphysics is killing us - but, more importantly, damning us. Fortunately, life isn't easy for the powers pursuing strategic evil (that is to say the planned destruction, and ideally inversion, of good - aiming at a world without good). There is a basic contradiction in trying to be wholly evil. The end point is to be the last remaining 'being', enjoying the terminal satisfaction of having annihilated everything else... And then annihilating oneself. Because 'oneself' is the final remnant of good (since all beings are God's children). But short of this envisaged final non-event; we need to be careful not to overvalue the achievements of evil: evil can only convince people that it can exclude good - it cannot actually achieve this. The persistence of good can be seen by the fact that evil must continually deploy bribery and coercion to suppress what would otherwise be the spontaneous arising of good here and there. Even if all this seems to be the case; we must remember that this world is the creation of a loving God and it is inconceivable that he would ever, under any circumstance, leave a single one of his children without possibility of salvation - when that child is capable of wanting it. No matter how complete worldly manipulation may seem to be, total manipulation cannot be a reality - there will be made (by God's power) the actuality of freedom and the possibility of agency - specifically there will be chances to think in free agency from our real selves; escaping all manipulations. Of this we can be sure; and to believe otherwise is merely to choose to believe otherwise. We inhabit a world where all institutions and nearly-all once-good individuals have been subverted and corrupted; and insofar as the subversion and corruption are systematic then they cannot be contained, channelled and directed only against The Good - therefore sooner or later systematic undermining and inversion will affect the institutions and persons of evil. People will then become cynical about evil; in the same way and for the same reasons that they have been corrupted into cynicism about Christianity, marriage, families etc. The triumph of evil will, in and of itself, engineer people into the situation where they find themselves utterly isolated - hence very difficult to influence in any predictable fashion: individuals will stand in awareness of little more than their existential essence - and that, in itself, is a state highly conducive to the intuitive recognition of the reality of God. In a sense, at the extreme the reality of God becomes unavoidable and each faces the stark choice of accepting or rejecting his creation and love. This choice cannot be compelled either way - and each has the resources to choose God, if he so chooses - a situation of extreme hazard for evil! Therefore, the closer evil comes to a situation of final victory, the more brittle and vulnerable that triumph becomes. We need to keep this in mind, and not succumb to despair in face of the incremental world-takeover by evil; but instead to hope - and understand that this hope is solid, realistic, hard-headed. 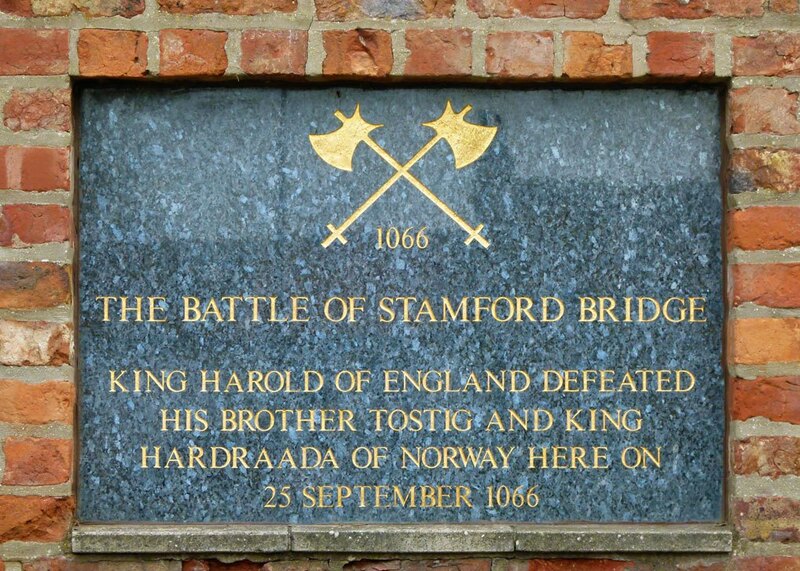 Today, September 25th, is the anniversary of the Battle of Stamford Bridge, fought in North Yorkshire on this day in 1066. King Harold's rout of Harald Hardrada's colossal pirate army stands as one one of the most spectacular military triumphs in Medieval history. 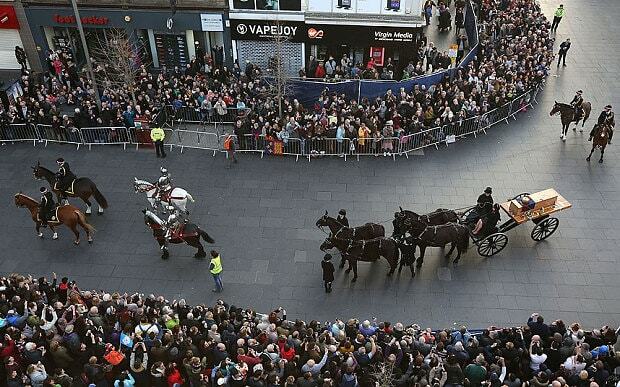 To my mind it ranks alongside Trafalgar and the Battle of Britain as an epoch-making defence of the realm. 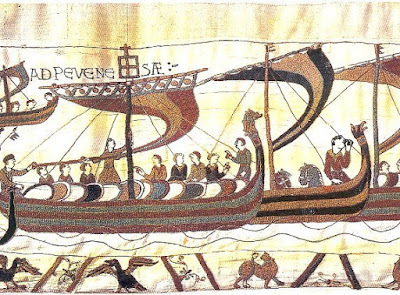 The Vikings had been ravaging English shores on and off for nearly three hundred years. The Battle of Stamford Bridge brought that chapter to a sudden and definitive end. 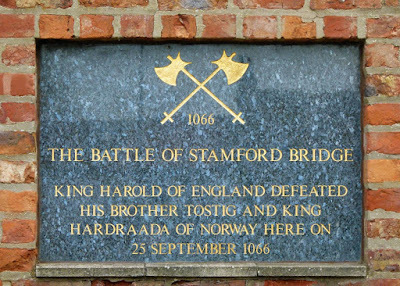 King Harold's triumph has been overshadowed, unfortunately, by his loss of crown and kingdom nineteen days later at the Battle of Hastings. One can only wonder what might have been had Harold not been so desperately unlucky. With both the Normans and the Vikings sent packing Harold would have stood as undisputed master of a confident, united realm. At the age of just 44, he could have looked forward to a reign of a quarter of a century or more and the establishment of his dynasty on the English throne. He had all the makings of a great King. His reign, I'm sure, would have inaugurated a third Anglo-Saxon 'golden age' of religion, law, art and learning, following those of Alfred (871-900) and Edgar (959-975). 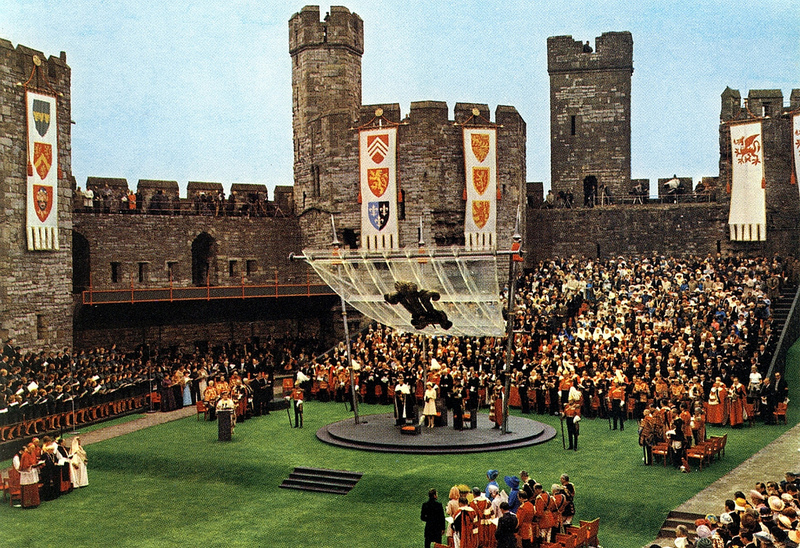 Much glory and goodness has emanated from this country since 1066. My intuition tells me, however, in a way I can't quantitatively account for, that if Harold had won at Hastings, England would have been more like the Albion we hope to awaken and less like the hard-nosed powerhouse she so often became - materialistic, mercantile, rapacious and exploitative. This is why I always shed a tear on 'Hastings Day', October 14th. I mourn what might have been and should have been but never was. The door to the 'third golden age' stayed shut. One day, I believe, it will open again. How and why I don't know, but it comforts me to know that J.R.R. Tolkien shared my sense of loss at Harold's death and the subjugation of Old England. Let us leave the last word to another fine storyteller then, the historian R.J. Unstead and his account of Harold's mighty victory in The Story of England (pp.62-63). 'When William of Normandy heard the news that Harold had been crowned King, he broke into a rage and proclaimed a crusade to win his "rights". While an invasion fleet was being built, hundreds of knights rode in to join his army, attracted like flies to honeybee the thoughts of plunder and land. The Pope himself sent his blessing and a banner, for William had made his tale good, although his claim to England was no more than an excuse for a military adventure. Harold did not fear the Normans. Indeed he longed for them to come all through the summer of 1066, for he had a splendid army assembled in the southern counties, far stronger than any seaborne force that William might bring. He was as good a soldier as the Duke, though more hot-headed, and he had an excellent fleet that would have given the Norman ships a rough passage in the channel. The summer wore on and the Normans still did not come, for the wind blew steadily from the north and kept their ships from sailing. As the corn grew ripe, the English soldiers became restive, thinking of their farms and harvest-time. Surely the Normans would not come so late to risk the autumn storms and a winter campaign? Harold had just disbanded his army and sent the fleet to the Thames, when a call for help came from the north. Three hundred longships had sailed into the Humber and an army of Norsemen, led by Harald Hardrada, King of Norway, was ravaging the land like a pack of wolves. Earl Tostig was there with the invaders, for he had invited Harald Hardrada, the giant Viking who had fought all over Europe, to come and take his brother's throne. Hardrada defeated the Earls of Mercia and Northumbria, and made them promise to help him against Harold. Then they waited for the English King at Stamford Bridge, a wooden bridge that crossed the Derwent, seven miles from York. With housecarls and as many fighting-men as he could gather, Harold came north at furious speed. In York, he learned that the enemy was only a short distance off, so, refusing to rest, he drove his tired men on without a pause. They came to Stamford Bridge, where the Norwegian host was camped on both banks, their armour laid aside and their ranks unformed. Harold sent a message to Tostig. He would pardon him and restore his earldom if he came across to the English side. "And what land will my brother give to Harald Hardrada?" Angrily, Harold replied, "To the King of Norway, I will give six feet of English earth. No, seven feet, seeing that he is taller than other men and needs a longer grave!" Then he gave the order to attack. The English broke through the forces on the west bank of the river but were checked by a gigantic Viking who held the bridge until he was speared from below by a soldier who had crept under the timbers. Once across the river, the English infantry cut the host to pieces and, as Harald Hardrada and Tostig lay dead on the field, they chased the remnant back to their ships. Harold had kept his word. The most famous war-captain lay in his seven-foot grave, the pirate army was destroyed and only a few survivors were sailing ruefully back to Norway. The English buried their dead and tended the wounded, as the monks sang the Thanksgiving in York Minster. What should be done and why should we do it? It is taken for granted here that we need to be Christian - that is the essential frame if we want to be sane and positive. What is needed is a metamorphosis of thinking - a qualitative change in the form of thinking. But specifically why must we change thinking? Aside from its fundamentally anti-Christian structure and assumptions and implications; what are the reasons? Positively, we want more and better than life can have with the way we currently think; negatively we are experiencing alienation and all the consequent nihilism (lack of meaning, purpose and relation). It is our divine destiny to move beyond our current way of thinking; this is the path of theosis by which we become more-god-like, more fully gods. We need to think the way God thinks - qualitatively. And if we do not, then our fate will be one of corruption, decline away from the divine; and ultimately of deliberate, purposive, self-chosen degradation, god-rejection hence damnation. We want to be free - we want, that is, to be awake, conscious, self-aware and active in thought; and not to be unconscious, constrained and compelled, asleep, distracted, and passive in our thinking. The new mode of thinking is for those who really want real freedom - as a priority. At present our culture is wilfully stuck in adolescence, clinging to perpetual youth; or else we turn back from this horror and attempt (only ever with partial success, because it is doomed to fail) to return to the mode of being of childhood. But we may wish instead to grow-up, to become more-and-more intensely and frequently as-God-is in thinking: the spiritually adult way of thinking and being. What - exactly - should we do? Do one thing - and that thing is Primary Thinking; or by another name, Final Participation (Owen Barfield); or by another name Pure Thinking, or the Imaginative Soul (Rudolf Steiner). But what does this entail? How would thinking actually change? In short it is thinking of the real/ deep/ divine self - and it is thinking that we recognise as valid and unbounded (it is heady stuff this thinking!). 2. Healing - therapy for the chronic sickness of our soul, the split between self and environment - between experience and theory; which has afflicted Man ever since the commencement of modernity with its self-consciousness. Thinking has (so far) been our plague; but primary thinking can become the cure of its own disease. 3. Meaning, purpose and relationship built-into our way of thinking (instead of being excluded by it). 4. A transformation, a beginning of evolution - the experience (and expectation of) a moving-towards the goal of metamorphosis, of a changed and better way of thinking and being. Primary thinking will be - by contrast - a joy, an enthusiasm, an excitement and an expectation; a recovery of deep and lasting motivation. 7. Agency and Freedom. Do we truly want to be free - free in our deepest thought? Live from our-selves, not coerced or passive but generative, creative? Pursuit of freedom, agency, creativity all become possible, indeed inevitable - in the deepest sense. In primary thinking, freedom is directly experienced - we can observe our freedom in-action. 8. Autonomy. Because our (true) self is divine, because God is within us, because we have direct knowledge of God; then we have a solid and certain basis for everything. We are not dependent on the chances of institutions, society, books, preserved traditions or uncorrupted authorities... even when these are all lacking, we can survive and thrive - by trial/ error/ repentance we can develop, and move towards The Good. We need not go it alone - we can and should accept genuine help when available and needed; but we are not dependent on the external. This blog is called Albion Awakening. However if we identify this idea with the notion of the majority of the inhabitants of the United Kingdom waking up to spiritual truth it's clear that Albion is not going to awaken at any time soon. We are too drugged by entertainment and the media, too brainwashed by atheist/materialist propaganda, too in thrall to technology and machines and too comfortably established in our artificial (both mental and physical) environments to wake up without being forced to by pain and suffering. That may come if we really show no sign of stirring but I’m sure the powers that be only use pain as a last resort. But if the spirit of Albion is awakened in the country that might be a different matter. I am not interested in Brexit. The EU is obviously an organisation that pursues an anti-spiritual agenda wrapped up in a liberal, humanist package. No wonder it is so popular with the educated elite who can pursue their self-indulgent way of life without disturbance. But Brexit, if it happens, will probably lead to a situation that is little different spiritually but may be worse economically. It is a red herring. However Albion, England’s spiritual alter ego, could waken from slumber as it (he? she?) has done occasionally in the past when roused by threat or great need or some other circumstance which calls out to the depths of the national soul. If this does happen it will be on a mental or psychological level. What form could it take? Perhaps there might be an increasing disgust with the shallow superficiality of modern entertainment and a search for deeper meaning. Perhaps there might be a rediscovery of history not viewed through the distorting, self-hating lens of political correctness. Perhaps there might be a sudden realization that we are destroying our country in both its physical and natural form and in terms of its people. 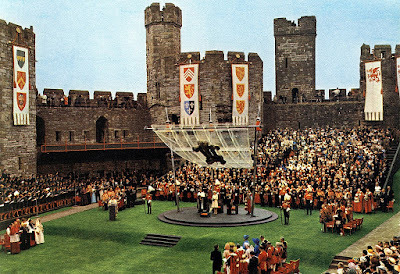 Or perhaps there might be a revival of interest in the stories surrounding King Arthur and other luminaries of the British past, one that responds to the true meaning of these kings, saints, poets and heroes without distortion by modernist prejudices. But however it comes any awakening will be sensed by us through the imagination. This is why it is the imagination that it most under attack by demonic powers through the perversion of art and culture inter alia. One thing I can guarantee though is that any incipient awakening would immediately be attacked by those powers. What I mean by this is that the demons who are currently trying to manipulate our reality to their advantage and our great loss would try to co-opt and derail any awakening as they have done in the past. As they did in the1960s, for example, when they corrupted the nascent spiritual revival with the agenda of the sexual revolution and as they did in the 1980s when New Age ideas were channeled into psychic rather than spiritual channels. Even the green movement, which had a lot of potential at one time, was hijacked and turned aside from any true spiritual direction by a left wing ideology which effectively neutralized it. Whenever truth appears the attempt to corrupt that truth follows. That is why we must remain vigilant whatever happens and never rest on our spiritual laurels. The dark powers always try to drag spiritual revivals down to a lower level so that the essence of the revival is lost though the form may remain. That is why purity of mind and heart is so important. Any weak spot will be sought out and exploited, whether that be lust or pride or greed or hate or fear, whatever. It is up to us to guard against these vices within ourselves. We can protect ourselves through prayer and visualization of Jesus or a favourite saint or other spiritual ideal but it is also important to be completely honest with ourselves. The devil is a liar and he works through lies and deception. He will try to get us to lie to ourselves about our motivations for example, but if we try to walk at all times in the path of love and humility while at the same time aspiring to truth at its highest then we are well protected. That’s hard, I know, but it’s what we have to do if we are to prevent any awakening, either personal or more general, from fizzling out into deception and disappointment. God needs his foot soldiers in this world and if you are called to that position, as most people reading this blog probably are, then you are fortunate indeed even if you suffer in your worldly life as it is more than likely you will. We have been assured that any hardship here and now will be more than compensated for later on. If communications are ineffective, how may Awakening be stimulated? I have argued myself into the conviction that - here and now - normal methods of communication are ineffective when it comes to the most important matters. They are either ignored or misunderstood; or even used against that which they advocate. Yet this is a communication - so what am I trying to achieve? I am trying to make negative point that may lead to positive action. My negative point is that (as you sometimes suspect) you live in a sea of mostly false and evil communications - which propagate fake facts and inculcate false concepts. And there is no sure way of discriminating between true and false communications - a matrix of lies makes the occasional nuggets of truth inaccessible and un-understandable; bad money drives-out good. But I can make the negative point that you dwell in falsehood when truth is available - If truth is actively sought. Because there is a creator-God, because he loves us; there is always and everywhere a way of knowing the truths that you need to know. But we are free agents, and can refuse the truth - and nearly-everybody does. And therefore (because of God being both creator and loving) - if you so choose - you will always be able to find and to know, that truth which is essential to your salvation and spiritual development. The Northern Lights have been seen over Britain. The report I read in The Daily Telegraph of 9th September described the phenomenon in strictly scientific terms - a series of solar flares, visually stunning, for sure, but bearing no deeper significance. An apocalyptic part of me wants to protest at this. Surely the coming of the Lights is a sign? A foreshadowing of some great event to come, as the appearance of Halley's Comet in April 1066 gave notice retrospectively of the impending Norman Conquest. 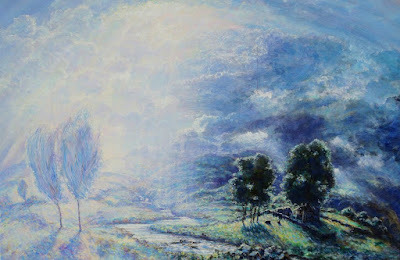 This theme is illustrated superbly in the passage below from Rosemary Sutcliff's Arthurian novel Sword at Sunset (1963). Ambrosius Aurelianus, the High King, is dying of cancer. He takes his lieutenants, Artos (Arthur) and Aquila, on a winter retreat in a remote hunting lodge to secure the succession. 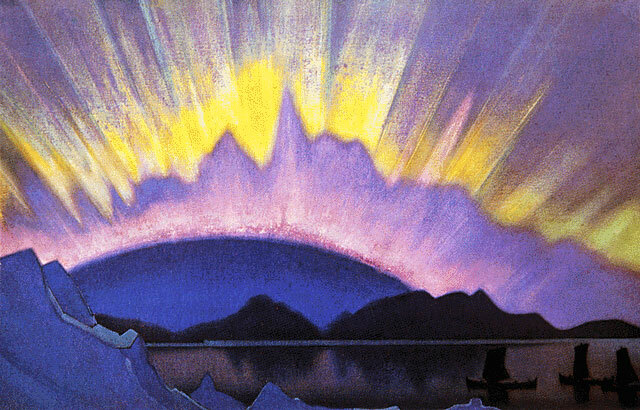 A tense political discussion is interrupted by the appearance of the Northern Lights. The tone and flavour of the evening is altered dramatically as new perspectives open up for all three men. Hearts start to soften. The display outside triggers deep-lying memories in Artos and Aquila and sparks a moment of fraternal understanding. Ambrosius, when he rejoins the conversation, speaks with an imaginative fluidity that was lacking before. The political becomes the mythical. Something hard and tight has been broken apart, creating a space for the deeper pattern behind the flow of surface events to emerge. This is the lasting impression left on the reader by Sword at Sunset - the political transformed into the mythical. Artos, in the end, follows Ambrosius' recommendation and succeeds him after his death, though not as High King but Emperor of a restored Romano-British Empire. Artos has many scars - physical, emotional and spiritual - and gains little satisfaction from his twenty year reign. He does, however, bring peace and security to the land, and through his words, deeds and presence, sows the seeds of the great national myth that has sustained the imaginative life of our country ever since. ... After we had sat in silence for a while, Ambrosius spoke again. 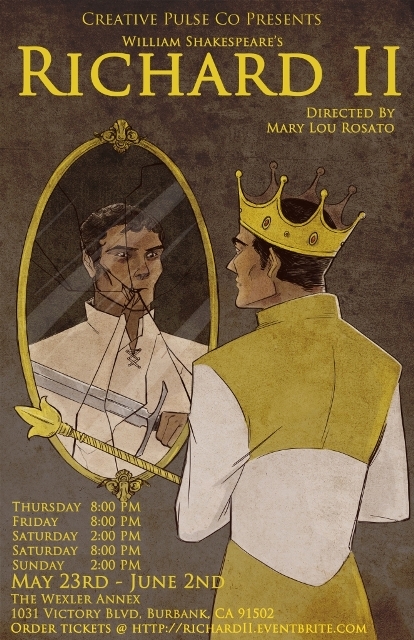 "Artos, I have a sense of fate on me. It is not merely that our scouts report certain movements of the Saxons. I believe in my bones, in my very soul, that a Saxon thrust such as we have not seen before is coming this spring - by midsummer at latest: and when it comes, there will be a struggle compared to which the battles we have known will be but candles held to a beacon blaze. And believing that, I must believe that this, above all others, is not the time to be leaving Britain in the hands of an untried king, but rather in the hands of a strong and well proved war-leader. As to what comes after, so far as the question of my successor is concerned, the victory in such a struggle would be a mighty weapon in your hand, Bear Cub, and if you fail, then Britain will not need a High King again." His voice had died almost to a whisper, hoarse in his throat, and his brilliant eyes were haggard, clinging to my face. Yet still I was half resisting; and not from humility but from lack of courage. I had always been one who dreaded loneliness, the loneliness of the spirit. I needed the touch of other men's shoulders against mine, the warmth of comradeship. I was a fine war-leader, and I knew it, but I shrank from the very thought of what Ambrosius was asking of me. I did not want the loneliness of the mountain top. Aquila had risen some time before, and tramped over to the window at the end of the room; he was something of a lone wolf, old Aquila, and his own deep reserve made him flinch from the least probing into the reserves of other men; and I suppose he did not want to see our faces while the last stages of the thing were fought out. Suddenly he spoke, without turning from the window. 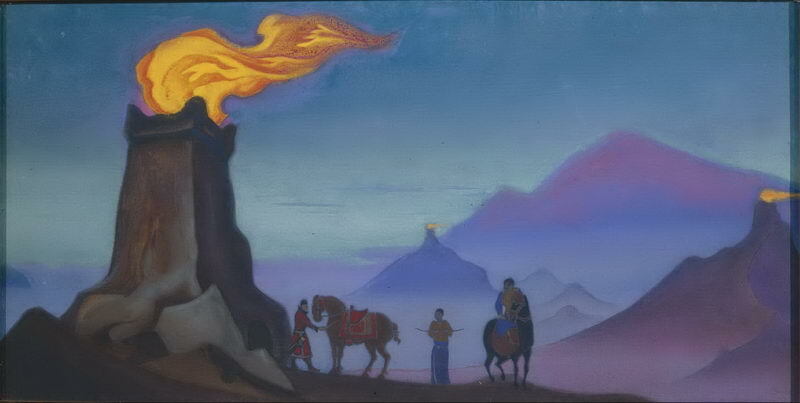 "Talk of beacon blazes, there's something big burning over yonder beyond Ink-Pen, by the look of it!" I got up quickly and went over to him. "Saxons! Open the window, Aquila." He lifted the pin and swung wide the glazed leaf, and the cold and the smell of frost flowed in against my face. The window looked north, and as the dazzle of the firelight faded from my eyes, and the stars began to prick out in the clear sky, I could make out a dull red glow in the sky, like red reflection of a great fire. Even as I watched, the glow was spreading, rising higher into the stars. "It would take a whole city burning to yield that glare," Aquila said, and I could hear the frown in his voice. And then the formless glow began to gather to itself a shape, a great blurred bow, and out of its brightness suddenly a streamer of light flickered up into the dark sky, and then another, and another; and I wondered why I had been such a fool not to know the thing at once - I suppose because in my mind it belonged to the North, and so I was blind to it here in the South Country. I laughed, and something in me lifted as though at the touch of a familiar magic. "No Saxons tonight, old wolf. It is the Northern Lights, the Crown of the North. Dear God, how many times I have watched those flying ribbons of fire from the ramparts of Trimontium!" I glanced aside at Aquila, whose exclamation told me that he had recognised the thing he looked at, at the same moment as myself. "Sa Sa! You too! You must have seen them often enough in your thrall winters in Juteland." "Often enough," he said. "They used to grow and grow until they were like great banners of light flying all across the sky; and the old men would say that they could hear a rushing of great wings overhead ... But one scarcely ever sees them here in the South, and then no more than the red glow that might be a farm burning in the next valley." There was a movement behind us, the scrape of a chair being thrust back, and a slow slurred step on the tesserae, and we moved apart to make room for Ambrosius between us. "What is this marvel? This Crown of the North?" He set a hand on my shoulder and the other on Aquila's, breathing quickly and painfully, as though even the effort to rise and cross the floor had been a day's labour to him. "So - o," he said, lingeringly, when he had got his breath back. "A marvel indeed, my brothers." For in that short while that we had been standing there, the light had strengthened and spread, until one got the impression of a vast arc spanning the whole night, if one could have but seen over the northernmost hills that hid it from view; and from that unseen arc, as though it were indeed the head-band of a crown, a myriad rays sprang out, darting and wheeling to and fro, flickering out half across the sky, like ribbons of coloured fire that licked and trembled and died and darted forth again, changing colour moment by moment from the red of blood to the green of ice, to the blue of the wild-fire that drips along the oar blades of the northern seas in summer nights. "I too have seen the glow like a burning in the next valley, and a flicker or so in the northern sky, from the high shoulder of Yr Widdfa," Ambrosius said, in the tone in which a man speaks in the place where he worships his gods, "but never the like of this ... Never - the like of this." Voices, scared and hushed and excited, were sounding in the courtyard, a babble of tongues and a running of feet. Down there they would be pointing and gesticulating, their faces awed and gaping in the strange flickering light. "The others have seen it now," Aquila said. "They could scarcely make more startling chatter if it were a golden dragon in the sky." "There will be many pointing to the north and bidding each other to look, tonight," Ambrosius said musingly. "And later, all Britain will tell each other that there were strange lights in the sky on the night before Ambrosius Aurelianus died; and later still, it will become Aquila's dragon, or a sword of light with the seven stars of Orion set for jewels in the hilt." I also acknowledged that this could not happen without first a general awakening of the people - a repentance of materialism and Leftism and a new spiritual Christianity; but there was certainly some degree of yearning that this whole process would be driven by some kind of externally-applied influence... Rather as if God was to shine a bright light on us and reveal things in a new clarity. Clearly this hasn't happened, and equally clearly if anything of the sort had seemed to happen it would almost certainly have been a fake of some kind: a deception leading somewhere even worse. What I have come to believe is that events are building and building upon each of us as free, agent individuals - Especially those (few?) who have not (yet?) capitulated to one or another of the varieties of materialist, secular Leftism which wholly dominate public discourse (including the discourse of nearly all self-identified 'right wing' people and parties, and the mainstream churches, who are apparently monolithically obsessed with economics, politics, power...). This idea that if things are true, then we ought-to-be overwhelmed by feelings and driven by mass movements is exactly what we need to grow-out-of. And if we don't then we will - sooner or later - join the enemy, or at least fuel the enemy's strength. I am struck by the fact that we regard thinking as an activity which can (and should) only destroy. It is thinking that has destroyed the unconscious and spontaneous spirituality of our childhood, and of earlier cultural epochs. So thinking is clearly powerful... yet we deny the validity of thinking when it is used to cure the ills of modernity. We assume that if something good needs thinking-about, then it is not really-real but only a kind of delusion of 'wishful' thinking. We assume that a Life cannot be built from thinking, that thinking is strong enough to destroy, but too weak to be a foundation of good living. I now understand better that truth comes to us in thinking in a way that deliberately and necessarily does not 'overwhelm' us. After all, is God overwhelmed by His feelings? Surely not! God is free; and so should we be. We need to be free in the same way as God, and that means primarily by thinking, not feeling (although feeling is, secondarily, a part of valid thinking). Thinking comes to us 'horizontally' - one thought linked with others beside it; and what we should be looking-for is not to be overwhelmed but to experience a kind of 'mythic coherence', that 'insight' which we get when we think our way to a part of Truth. This is a wonderful feeling, familiar to a scientist who has struggled for a long time to understand; then reaches an answer of simple clarity which coheres with his best knowledge. In sum - instead of the attempt to return to an unfree, child-like state in which reality overwhelms and compels us; I now seek to understand reality as akin to such discoveries I have made in science; characterised by such features as insight, rationality, coherence; and that explanatory fertility which is a characteristic property of some-thing real. The spiritual philosophy of non-duality is increasingly popular today but, while it claims to give a pure and unvarnished description of reality, I believe it rests on a metaphysical mistake. It derives from India, where it is known as advaita, and it basically reduces everything to undifferentiated oneness, regarding anything other than that as, to all intents and purposes, illusion. Thus it is prepared to offer multiplicity a conditional reality for those in a state of ignorance but ultimately sees it as unreal. A subtler grasp of how things are sees oneness and differentiation existing right down to the wire, being two parts of the one whole with the latter not in any way unreal, though still seen in the overall light of God. God is the source of everything, of course, but what he creates is real. It is important to get this right because our understanding of spiritual reality affects everything we think and do and feel and are. Non-duality is a very easy philosophy to adopt and consequently think one has 'cracked the cosmic code'. It's also convenient in that it does away with God which suits the modern mentality very well. But if understood to mean that there is the One and nothing else has any reality at all, it rests on an error. Certainly all serious religion acknowledges the unity of God and see all life as his but rather than using this to deny the reality in creation a more alert understanding sees that God gives his life to creatures and that they then have their own life, given by him but still theirs, and that this is perfectly real. The absolute oneness posited by non-dualists only exists in the realm of the complete unmanifest and unexpressed. Move one metaphorical (or metaphysical) inch away from that and this oneness, though underlying all, is immediately qualified by other expressions of truth which must always be considered if one is to understand the whole. In fact, for the created being, which we all are, they are in a certain sense primary. The contemporary Westerner is so indoctrinated with the scientific world view and so much in reaction against traditional Christianity that when he belatedly turns to any kind of spirituality he frequently, wittingly or unwittingly, requires that to fit in with his pre-existing human-centric atheism. Consequently God has become something of a non-necessity in contemporary spirituality which is why Buddhism is so attractive to many people nowadays. It seems to offer spirituality without the disadvantage of God but this is precisely one of its flaws and why, whatever its historical necessity and appropriateness in its original time and place, it is not so suitable for Western people today. The cultural context is different and Buddhism tends to fortify existing deficiencies rather than correcting them as it might have done in the theistic context in which it arose. So much does depend on cultural context which is why Zen Buddhism would have been helpful for culturally conservative medieval Japanese while not being so for beat poets in the 1950s who were reacting against conventionalism already. They needed something with more structure that would counteract their particular excesses and we do too. That is why we need God. Of course everyone, Buddhists included, needs God but he may perhaps be set aside for a while if the concept of him has solidified and the image become more important than the reality which was the case at the time of the Buddha. Non-dualists and Buddhists don't sufficiently appreciate that our nature is not a unity but a trinity, all parts of which make up the whole. That is to say, they focus on the uncreated part of our being, the part that never leaves the divine world, ignoring that this is only a part of what we are. In reality we are not just spirit overlaid by various unreal 'sheathes' but spirit, soul and body, all of which contribute towards the wholeness of our being, and if we deny any part of this then we are not living in truth. To mistake the highest part of our being for the only real part is an error which you might categorize as a kind of intellectual absolutism. In fact, our spiritual goal is not to return to unmanifest existence as though our life in a body was an irrelevance but to learn the lessons of incarnation in a material world, the primary lesson being that of self-sacrifice in love, and this we can only do by giving all parts of reality their full significance. Richard II (1597) is not an action-packed play. It is spoken entirely in verse and has a still, reflective quality which renders it more akin - to my mind at least - to a stained glass window in a Medieval cathedral than the narrative cut and thrust of a conventional stage production. Like the window, Richard II is a heraldic work of art - emblematic rather than dramatic, a portrayal rather than an exposition. That is not to say, of course, that there is no story. There is. King Richard II is deposed by his cousin, Henry Bolingbroke, and subsequently murdered in captivity by a noble trying (and failing) to win the new king's approval. But the story is of secondary importance. It is what we are shown along the way and what Shakespeare asks us to reflect on that counts. What Richard neglects, however, is his side of the deal. He fails to act as a king should, as a steward of the land. Richard is no blood-soaked tyrant à la Macbeth. On the contrary, he cuts a charming and cultivated figure. Nonetheless, he surrounds himself with flatterers, spends extravagantly and levies provocatively high taxes. Most damagingly of all, at the death of John of Gaunt, Bolingbroke's father, Richard seizes the properties and monies of both father and son, inviting thereby Bolingbroke's return from exile and encouraging the English nobility to rally to his standard. Than it issued forcèd drops of blood. Richard's deposition and death prefigure the fate of Charles I in 1649, another monarch with a knack of making enemies who relied overmuch on his divine right to rule. Charles, unlike Richard, was succeeded not by a usurper king but by no king at all. Oliver Cromwell ruled as Lord Protector for a decade and when the monarchy was eventually restored, in the person of Charles's son, Charles II, it was with its powers severely curtailed. Charles's martyrdom foreshadows in turn the executions of Louis XVI of France and Nicholas II of Russia (along with his family) in 1793 and 1918 respectively. Aggressive, totalitarian regimes assumed control in both countries, a significant step down from Cromwell's principled, if austere, autocracy, which in itself represented a decline from the ousting of Richard, who was at least replaced by a fellow sovereign in Henry IV. And future ages groan for this foul act. Any spiritual revival in his land will go hand in hand, I feel, with a renewed appreciation of the monarch as a sign and symbol of God's covenant with the country. The archetype of the king or queen runs deeply in hearts and minds. The huge crowds lining the streets of Leicester (Britain's most multicultural city, it should be noted) for the reburial of Richard III in 2015 bear potent witness to this. The potential for national renewal already exists therefore. I also believe that the presence of Prince Charles on the national stage offers further hope and encouragement for a spiritual, cultural and political renaissance. 'For the past 15 years I have been entirely motivated by a desperate desire to put the “Great” back into Great Britain. Everything I have tried to do—all the projects, speeches, schemes, etc.—have been with this end in mind. And none of it has worked, as you can see too obviously! In order to put the “Great” back I have always felt it was vital to bring people together, and I began to realise that the one advantage my position has over anyone else’s is that I can act as a catalyst to help produce a better and more balanced response to various problems. I have no “political” agenda—only a desire to see people achieve their potential; to be decently housed in a decent, civilised environment that respects the cultural and vernacular character of the nation; to see this country’s real talents (especially inventiveness and engineering skills) put to best use in the best interests of the country and the world (at present they are being disgracefully wasted through lack of co-ordination and strategic thinking); to retain and value the infrastructure and cultural integrity of rural communities (where they still exist) because of the vital role they play in the very framework of the nation and the care and management of the countryside; to value and nurture the highest standards of military integrity and professionalism, as displayed by our armed forces, because of the role they play as an insurance scheme in case of disaster; and to value and retain our uniquely special broadcasting standards which are renowned throughout the world. A flawed vessel without a doubt. Like all of us. But the prospect of an individual capable of such thoughts ascending to the throne should surely bring good cheer to all of us engaged in the holy (and uphill) task of rousing Albion from sleep. Awakening cannot be compelled - nor is it a mass phenomenon. It is a consequence of individual freedom, it must be chosen. What, then, could compel people - I mean individual persons - to a situation in which the choice of Awakening was stark and simple, and evasion become all-but impossible? Due to the subversion, corruption and inversion of the mass media and all major social institutions - communication (via the senses - via visual and auditory channels) is nowadays useless. What remains is direct knowing. In which pure thinking (of an individual) participates-in universal reality - thereby knowing other people, places, times, things... directly. Direct knowing is an attribute of the real self... (that is the deep, true and divine self - as contrasted with the multiplicity of superficial, false selves developed for reasons of expediency, or induced by interaction with modern life). Only the real self can have real knowledge - yet we are unstable complexes of false selves: fake selves. Only real knowledge is valid - yet we live in a world of false knowledge: fake knowledge. Only the real thinking or our real self is true; yet we live in a world which inculcates that reality is fake, and only the fake is real. In The West, we go further and further into the false knowledge of false selves: this is our public world; and (with mass media, social media, propaganda) our public world is more and more pervasive. We inhabit a vast superstructure of deliberately-manufactured and elaborately-sustained falseness, irrelevance, uselessness: a fake world. But if this fake world is not continuously sustained, imposed, fuelled, repaired; then it will collapse within the mind - and an individual will be confronted by its opposite: which is intuitive knowing. So, awakening may come to a person when he or she is confronted by the fake knowledge of their fake selves. The two go together: the self and the knowledge. Both the self and our knowledge need to be recognised as fake simultaneously. The superficiality and evil of our times are a consequence of the fact that we are superficial people who are merely processing reality (not thinking and knowing reality); we are not thinking, but instead using processing-routines drilled-into-us by the pervasive world of mass and social media, institutions and propaganda and advertising. Our mental processing is merely-habitual, and incoherent rather than valid. It is evil because false in knowledge - we accept false information and draw false conclusions. In a world were communication is pervasive and addictive and fake - communication is the core of evil. The enemy of communication is direct knowing. Our primary task is therefore to know directly; which entails to live from the primary thinking of our true selves. We will all, sooner or later, be confronted by this reality: confronted but not compelled - we cannot be compelled to reject the fake and embrace the truth. But we can be compelled to make the choice in a situation of maximum clarity about the issue at stake; that issue being the salvation of our souls. In the second epistle to the Thessalonians St Paul writes of a 'strong delusion' that God will send to those who refuse to love truth. This seems a little unfair. Why make things harder for those who are already erring? But it echoes Jesus's statement that more will be given to those who already have while those who do not have will lose even what little they do have. What's going on here? I think Jesus is saying that the act of opening one's heart to God allows you to receive all kinds of spiritual benefits while closing your heart to God will cut you off from the spiritual world so you plunge further and further into darkness and delusion. Note that spiritual benefits does not mean the good things of life. It may entail suffering and hardship but you will be brought closer to truth and eventual release from the chains of this world. You will be led to liberation. What St Paul says is something similar. Those who deny God are given what they want. Which is a lie. Their initial act is a rejection of the truth that is both within them and also proclaimed in both nature and scripture if we look with unprejudiced eyes. This rejection is caused by egotism. It is an act of will not intellect. They have chosen untruth so God sends them more of that, not to punish them but to give them the results of their decision. Obviously God does not punish in a mean, vengeful sense but acts and choices have consequences, and the strong delusion is the consequence of the denial of truth. You might say that God gives you enough rope to hang yourself with if that's what you want to do. You have a test of your spiritual integrity and if you are not equal to that because of what ultimately amounts to a moral failing (yes it does) then the strong delusion is provided for you to confirm you in your ignorance. Your heart could not be tested if there was not a plausible alternative to belief in God. The strong delusion is an (apparently) viable alternative that can be used to justify unbelief if that's what you want to do even if, when examined with honesty and clarity, it does not hold up. So what is this strong delusion? Assuming we are living in the end times what could it be? 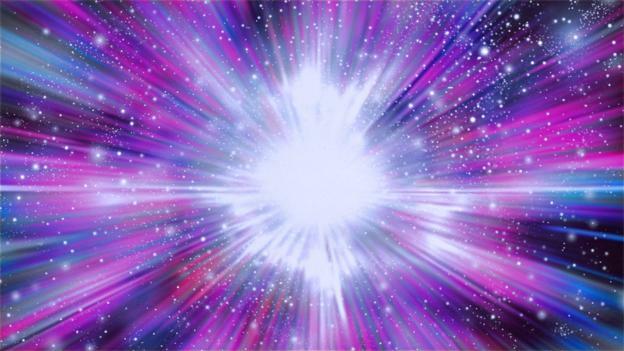 By the way, it seems more and more likely that we are indeed living in something approximating to the end times since however far man has fallen in the past he has always known that he has fallen whereas now he likes to think he is progressing, so much has he lost sight of his origins and destiny. It is only recently that he has sunk so low from a spiritual perspective he believes himself to be higher than ever. Assuming, then, that these are the end times, what is the delusion? There are several candidates ranging from general atheism to materialism to Marxism (hard or soft) to Darwinian evolution which sees intelligent conscious life as arising from dead matter through random mutation of its component parts. It could be any of these but today there is actually something that combines them all and that is Leftism, the popular belief system of the modern world. The strong delusion must be shared by many, if not most, people. It must be the accepted wisdom of the worldly elite. It must be anti-Christian in spirit. It must corrupt nature. And it must be thought of as good in the light of how we see the world. All these things apply to Leftism. Leftism is the strong delusion of the modern world. This leads us to the question in the title of this piece. What is spiritual awakening? And the answer to that, or a good part of it, surely is awakening to the truth that modern Leftist thought is a 'strong delusion'. This doesn't mean abandoning the humanitarianism that is the supposed justification of the Leftist claim to truth but seeing that in the light of the reality of God not man. For the religion of Man, which is what Leftism is, is a false religion that steals concepts relating to the spiritual plane and misapplies them to worldly levels without acknowledging the higher world from whence they derive and without which they have no meaning. To take just one example, pertinent at the moment, Leftism sees it as the right thing to do to help a man who wants to become a woman to do so because a person has the right to be what he wants to be. But the spiritual view sees this as a rebellion against God's will for you and a refusal to live your life as intended. In terms of Hinduism it is rejecting your karma (destined path) and your dharma (duty in life). And, as it is said, it's better to do your own dharma badly than somebody else's well. Furthermore to fight nature is to fight God who made nature. Nature is meant to be transformed by grace not deformed by man. So we must awaken from the false idea that man is meant for man and see men and women as meant for God which means see them in the light of the reality of God not the false reality of their own light. Spiritual awakening means acknowledging the reality of the vertical axis which we have completely lost contact with, seeing everything as only existing on a horizontal plane. It means acknowledging transcendence. The strong delusion is the denial of transcendence.